Wedding of Stephanie and Scott Toth. Photography by Melissa Durham Photography. From the moment Scott Toth proposed, he knew there would be a “Honey Do” list. His fiancee, Stephanie Barke, was a former wedding coordinator, so he knew there would be a list — and a big one at that. 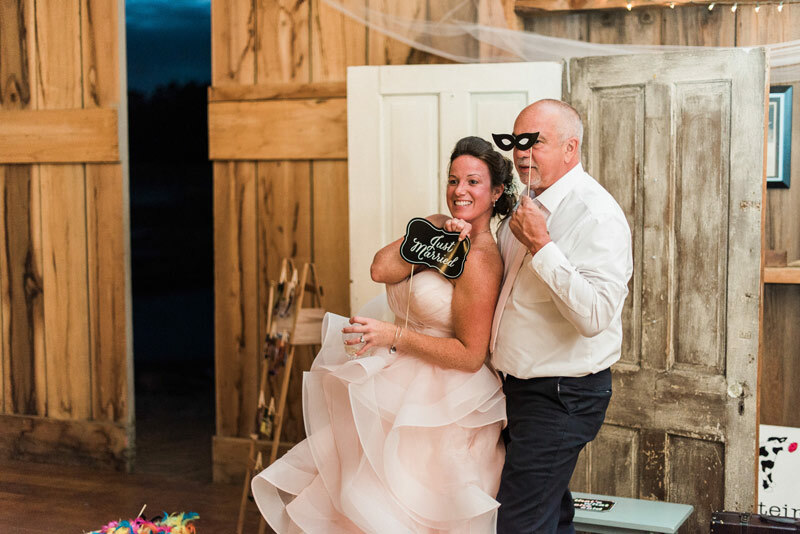 Stephanie and Scott married at the rustic Party Barn at Farmer Tom’s in Reisterstown on Sept. 30, 2017, after becoming engaged on Christmas Day. 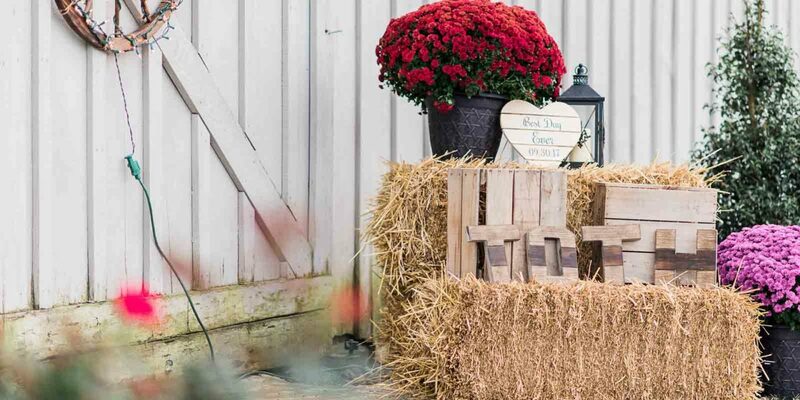 The Honey Do list for grooms usually falls into three categories: music, transportation and food. “Grooms often take the lead on finding the perfect craft beers and wines,” Shafer added. On Facebook in January, Stephanie found the venue. 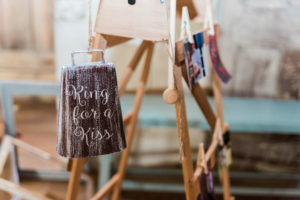 Instantly, she had ideas running through her mind about props for the photo booth and items for the reception. Like many grooms, Scott attended the Baltimore Bridal Showcase last February (after being enticed by the bar, he jokes). They got ideas to supplement what Stephanie envisioned and she researched to come up with others. Stephanie gives her fiance props. “Scott is very good at taking an idea and picturing it and turning it into his own,” she says. Stephanie scoured antique shops and found old doors and stools. Scott hinged the doors together, reinforced them so they could stand alone, and created a casing mechanism to hold an iPad and secured it to a tripod. But that wasn’t all. He set up the iPad with an app that stored the photos on the Cloud and allowed them to email the photos to friends and family members. 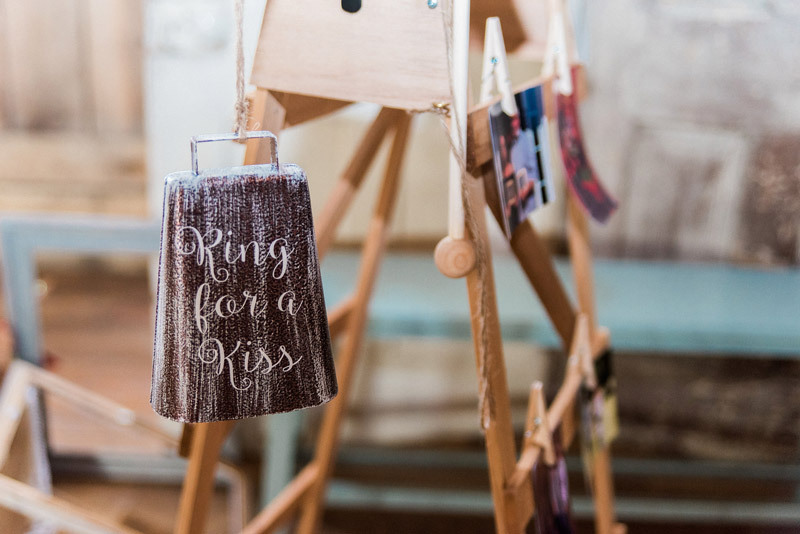 When Stephanie ordered a cowbell, for guests to ring to elicit a kiss from the newlyweds, Scott created a freestanding wooden lattice stand to match her vision. He also hung a mallet alongside it. Scott, a software program manager and former machine shop worker, stepped up to the challenge. He says he could visualize Stephanie’s ideas and used logic to find solutions. He travels for work, but said he planned his projects in between trips — and Stephanie’s checklist helped him keep track. He admits taking his time to get things done, however. Stephanie’s to-do list was presented often. After a while, it became a do-it-now! list. Another of his creative projects was a wooden cupcake stand made from an old wooden ladder fitted with shelves to hold the cupcakes. That project took a while, to Stephanie’s dismay, as did finalizing the list of groomsmen and their attire. And in true Scott fashion, the couple attended a family wedding the night before their own. They were forced to decorate the barn in a hurry. Stephanie concedes that she’s a planner. She has lists for everyday details. Scott knows what he needs to do, but admits that he procrastinates. “It’s kind of a joke now,” he laughs.